Crispy, delicately spiced samosas made from scratch, read on for my recipe for authentic Gujarati samosas – pastry and filling. I love samosas – they are the best Indian snack food but sadly, as popular as they are, they are rarely good. A good samosa should be crispy on the inside and soft and delicately spiced in the middle. The crispy pastry is made from rotli/chapati dough (not filo) with added salt and lemon juice – the dough discs are half cooked before being filled, folded and fried. The traditional Gujarati filling is a potato and pea with garlic, ginger, onion, chilli and turmeric. Coriander seed and cumin is also added.The other common filling you’ll find (in meat eating areas) is minced lamb – flavoured in the same way and sometimes with clove and cinnamon. Allow yourself a few hours in the kitchen, samosas have several steps to them and they are perfect if you want to spend a Sunday afternoon in the kitchen. Each step is quite straightforward – as long as you take your time you’ll be ok.
Rub together the flour, semolina and oil, til it is all combined. Add in the salt and lemon juice and mix with a fork. Add in half of the water and stir with a fork, add the other half and mix again with the fork. As it starts to come together get in with your hands and knead into a soft but not sticky dough. Divide into balls, approximately the size of a lime and then roll each out in to a circle. You want the pastry to be fairly thin, about 2mm. Save a couple of small pieces of pastry, to test the temperature of the oil later (or you can use a cube of bread or potato). Heat a non stick frying pan, or tava, til it is very hot, then turn down to a medium heat. 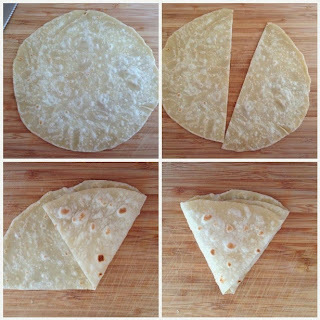 You can roll out all your pastry circles and lay them out and cook one after another, or roll as you cook – it depends if you can keep an eye on both! Cook the circles for 30 seconds minute on each side, just enough to lightly colour them. You want the dough to be half cooked, so they are easy to fill and also to fry later. Stack up on a plate as you cook them. Cover with a clean, damp tea towel as you make the filling. Fry the onion til translucent, then add the garlic and ginger and fry for 30 seconds. Add the potato and stir well – then add in the chilli and the spices along with a pinch of salt. Fry for a few minutes on a medium-high heat, stirring all the time. Then add a splash of water, and cover. Reduce heat to medium/low and cook with the cover on for about 4 minutes. Remove the cover, stir, simmer for a few minutes if you need to reduce the water a little. Switch off the heat, stir in the peas, and leave to cool. Flour and cold water for glue. Make a glue by combining about 2 tablespoons of flour with half that amount of water, adjust til you get a thick but spreadable glue. Dab glue on to the straight sides of the samosa wrapper, fill with potato filling and then glue the top closed. Check for gaps and dab some glue on to the point and squeeze closed. At this stage, if you’d like to save the samosas for another time, you can freeze them on a baking tray – once frozen put into a freezer bag. Defrost fully before you come to fry them. Add vegetable oil to a medium saucepan and heat on a high heat for a few minutes, then turn down to medium. Test the temperature by adding a small piece of pastry to the oil, if it bubbles and rises to the surface within 10 – 15 seconds the oil is done. Add about 4-5 samosas to the pan and fry for around 4-5 minutes til deep golden colour. Turn them every minute or so to ensure they cook evenly. Too high heat will cause the pastry to burn and not cook through, a medium high heat will ensure they stay crisp but not oily and cook throughout. Once done, remove and drain on kitchen paper. Baked Version: I also tried baking some, which turned out nicely, not as flaky but still crispy and crunchy – and of course a little healthier. Brush with oil and bake on a tray in a medium oven for 20 minutes, turning half way through. I really hope you make these, you won’t be disappointed! I’ve got 10 of them stashed away in the freezer, a smart move as the first batch disappeared in minutes.